Snopes has an amazingly good analysis of why “Ring Around the Rosie” isn’t actually code for the bubonic plague. The biggest key is that the rhyme did not first appear in print until 1881, which is a really long time (read: about five centuries) after the bubonic plague scourged Europe. Printed reference to the bubonic plague interpretation, in turn, first showed up James Leasor’s The Plague and the Fire in 1961. If the rhyme really were about the Black Death, you’d think someone would have written such a history down a long time before 1961. Hush! Husk! Hush I hush! Less is known about the melody that goes with the rhyme. The version I learned as a kid in 1970’s middle America is pretty close to what is heard in this video, but apparently the melody has transformed vastly over the years and countries. 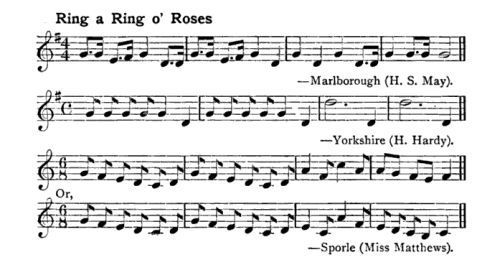 Musical variations of “Ring a Ring o’ Roses” by Alice Gomme, 1898. Graphic via Wikipedia. The sheet music you see above, dated 1898, shows regional variations in the tune… and they sound pretty different from what I’d learned. So, it looks like “Ring a Ring o Roses” has a long history… but not one that involves the death of 30% – 60% of the population of Europe. That history does, however, somehow include an apparently terrible horror movie. Where have you heard this tune or rhyme recently? I wonder about the “Shave and a haircut two bits” thing. I’ve seen it around from Looney Tunes to a recent episode of Big Bang Theory. I have no idea where its origins lie.